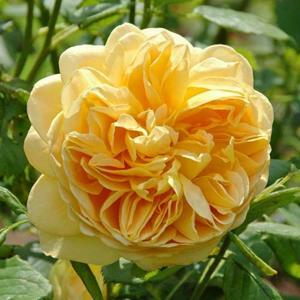 English shrub rose producing large double golden yellow flowers from June to September. Strongly scented. Bushy habit with healthy foliage of dark green pinnate leaves. Fertile, moist, well drained soil. Best in part shade to prevent scorching of the petals. Produced by David Austin Roses, a cross of R. 'Charles Austin' and R. 'Abraham Darby'.